How quickly is social media catching on as an engagement channel for SMB customer service and support? It depends on who you ask—and has significant implications for both SMBs and traditional CRM vendors. In our joint SMB Group-CRM Essentials “2011 Small and Medium Business Social Business Study,” we surveyed 750 SMB (small business is 1-99 employees; medium business is 100-999 employees) decision-makers about their use and plans for social media for sales, marketing, customer service and support, product development, HR and other business functions. 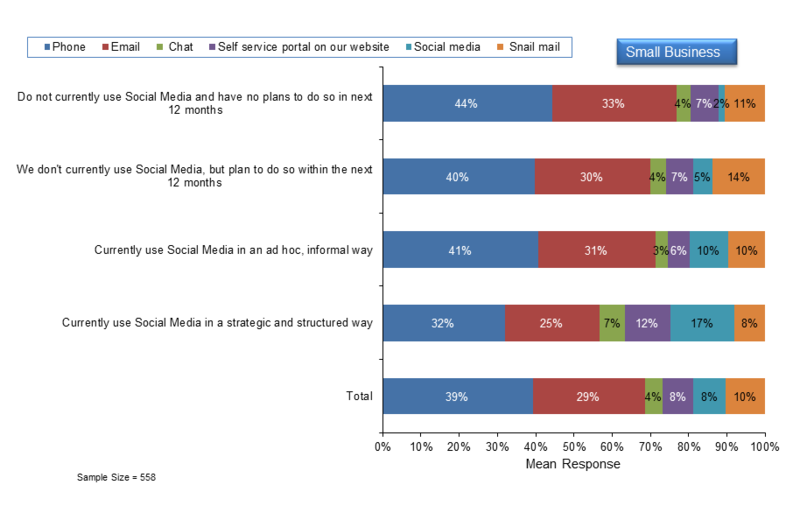 Across the total small business respondent base, social media accounts for about 8% of customer service and support interactions that are initiated across the total small business respondent base (Figure 1). In and of itself, this data point is significant: social media has already equaled or surpassed live chat and self-service portals (which have been around for many years) and is poised to gallop past snail mail. Based on other data in the survey, we expect that when we repeat this study next year, social media will have gained significant ground as a customer service/support channel at the expense of all of the alternatives. In small businesses that use social media in a strategic and structured way, 17% of customer service/support interactions are initiated via social media. This compares to just 2% among small businesses that don’t use and have no plans to use social media. The percentage of customer service/support interactions via social media roughly doubles as these businesses get more involved with and committed to social media as a vital part of the business. We also found that while social media already accounts for a significantly higher percentage of customer service/support interactions in medium business than in small, this trend is just pronounced: Customer service and support interactions via social media rise in direct correlation to more engaged and strategic use by the business. SMBs that continue to think that Twitter is just for Charlie Sheen or that Facebook is only useful for Sarah Palin do so at their own peril. Increasingly, social media is the first stop customers’ make when they have a gripe or an issue. SMBs that are tuned to relevant social media conversations and can effectively harness social media to respond will rapidly gain competitive advantages over those that drag their feet. Meanwhile, although traditional CRM vendors are integrating social media into their solutions, most are concentrating more on marketing, and less on customer service and support. Although marketing is certainly at the forefront of SMB social media adoption, our research indicates that CRM vendors will need to do more in the customer service and support area—and do it more quickly—to keep pace with the changes that social media is fueling in this area. Next Next post: Intuit and Salesforce Partner Up: Who’s the Big Winner? Buying into managing customer care directly in Facebook and other social networks sets a precedence and expectation that once offered will not easily go away. Of course the social networking sites would prefer to have you walled in their e-commerce engines, but is that really best for consumers? Easy access to an organization’s service and support infrastructure from relevant social networks is clearly important for many brands. But, being hamstrung by any social platform’s inherent limitations and being expected to deliver responses in minutes (for free!) only seems to pass prudent business analysis for a small percentage of organizations. When and why it is important for an organization to embed one’s support technology directly in the social networking platform rather than making access readily available to unencumbered support systems infrastructure optimized for the particular consumer need and consistent across all the relevant social networking sites as they come and go? Essentially, when should a social networking site be an access point for gaining support and when should it be a channel? Another question: When do you think it makes sense for an organization to use social monitoring software that does not scan the entire web and rather only scans FB and Twitter? I am clearly biased, but am I wrong? What do you think and why? Not sure I’m completely clear on your first question, but I don’t see this as an either or situation. For some companies, integrating Facebook, Twitter streams, etc. into a customer service platform is probably a good approach. But this may be overkill for small businesses, for whom Facebook may suffice. On your second, the best scenario is to use social monitoring software that scans the entire web. But once again, this isn’t always feasible for all businesses! Would love to chat and exchange thoughts on these and related topics. I do not think that the size of the company really enters into the equation. Either it makes good business sense to extend support directly through the social network or it does not. The focus needs to be on what delivery best supports both the consumer/stakeholder and the businesses strategic objectives. The decision to use social networking sites as a platform rather than as an access point are consequential and far reaching. Sure a company could take streams into their support systems from social networking sites along with providing ready access to their optimized channels, but when does that strategy make good, long-term sense? Please feel free to contact me directly if you would like to discuss further. I don’t believe the size of a company has much to do with the decision to use a given social networking site as a channel rather than an access point into their support infrastructure that has been optimized for the particular consumer intent. Either it makes good strategic business sense – now in in the foreseeable future — or it doesn’t. Sure a company could elect to do both, but if it does not make good business sense, then why incur the costs and be hamstrung by each social network platform’s inherent limitations and create the expectation with consumers for getting near immediate responses? I can see that it may very well make sense for companies that live and die in a given social networking platform, like some of these gaming companies, but otherwise when does it make good business sense? I can completely see from a customer perspective that is it appealing to get near immediate support without paying a premium, but I fail to see many business models where that would make sense. If the plan is to just allow the requests for support through social networking channels to be queued up and the customer gets help within service levels for other channels, it won’t even make much sense to consumers. I also find it pretty ironic that FB, Twittter and all these vendors touting that you have to “be where your customers are” are not providing this free and immediate support directly through social network channels. I guess this is just another example of do what I say, not what I do. Feel free to contact me any time if you want to discuss further. Please email me and we will set up time to chat next week.